In December, dandyhorse contributors and friends came to celebrate the new year at our holiday party at the Emmet Ray. As part of the festivities, we raffled off an Opus Classico bicycle. Brendan Agnew-Iler held the winning ticket, and rode home from the party that night on his brand new wheels. My parents sold their last car when I was four. We used to ride around town in a bike convoy (parents at the ends, kids in the middle). Riding with my father to school and with my mother home were important parts of the day. It was focussed one-on-one time, a chance to ask my parents all the difficult questions that trouble a child’s mind. The ride home at night is still one of my favourite things: the quiet streets and fresh air, the cold winter night made warm through exercise, the food and drink from the night being metabolized, the thoughts and feelings of the day repeating and slowly receding to the gentle rhythm of legs and lungs. I love what dandyhorse is doing and went to the party to check out what kind of culture is growing around what, to me, is essentially a solitary activity. When I won the bike my first impulse was to try to ride it out through the bar. It was probably the only time in my life that it would be remotely acceptable to ride through a crowded party. And decades of negotiating for space has taught me that you take up a smaller dynamic envelope riding a bike than you do walking one. There was also a short stairwell on the way out that would have been really fun to ride down. (It should also be noted that there was abundant free beer at the party.) In the end I chose to walk the bike carefully out. I took this as an indication that my decision-making was not at all impaired. I had invited a friend with me to the party. I believe that everything you do with a car can be done better with a bike so, naturally, I insisted on riding her home. (Tammy graciously lent me a bike light.) It was a stable and comfortable double ride. The step-through frame came in handy for mounting the vehicle with an adult woman already perched on the seat. My companion told me stories about how proper Russian men took women for rides on motorcycles (though I think she agreed that my way was more fun). 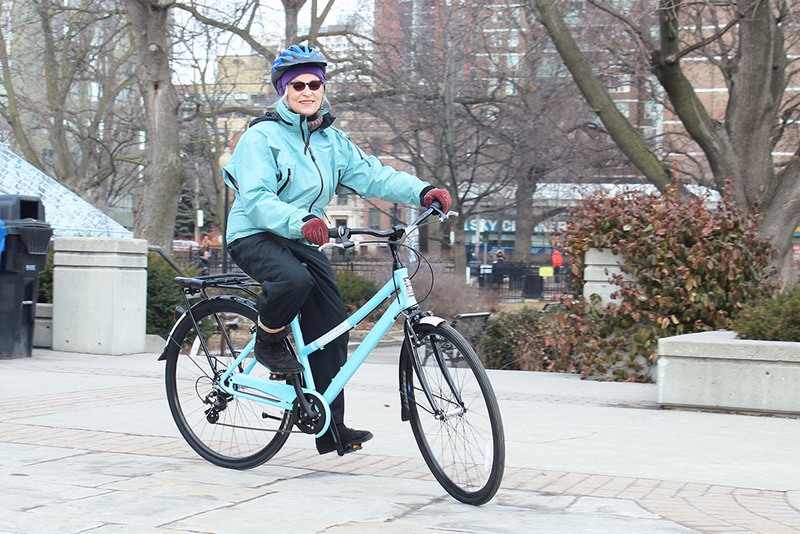 She reported that the seat was comfortable, even through the potholes of Trinity Bellwoods. Sitting at home beside my four-year-old daughter’s first big-kid bike, my new Opus Classico reminded me – in shape and colour – of the bike my mother had when I was little. It recalled rides home at night sitting behind her, my face buried in her backpack for shelter from the wind, at a time when my mother was big and strong and I was the vulnerable passenger. 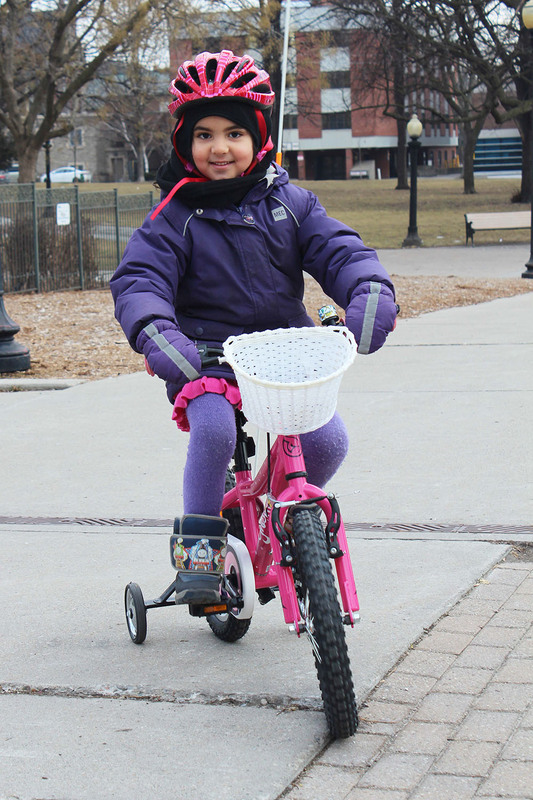 My daughter is four and patiently waiting for spring, when she can take her new wheels out for a proper ride; my mother is almost seventy and still riding all year round. The Opus is a solid, comfortable, reliable bike with good brakes. Marty at Broom Wagon graciously offered to let me exchange it for a larger one. Instead, I gave it to my mother. "I have taken the bike for a ride. It is very smooth, solid and lightweight. The brakes are incredibly good and I will have to get used to them. I have to remember to use the back brake to slow down so I don’t go over the handlebars. This is a bike for someone who wants a good set of gears for hills but the high end isn’t great for speed. I could use seventh gear anywhere in the neighbourhood." 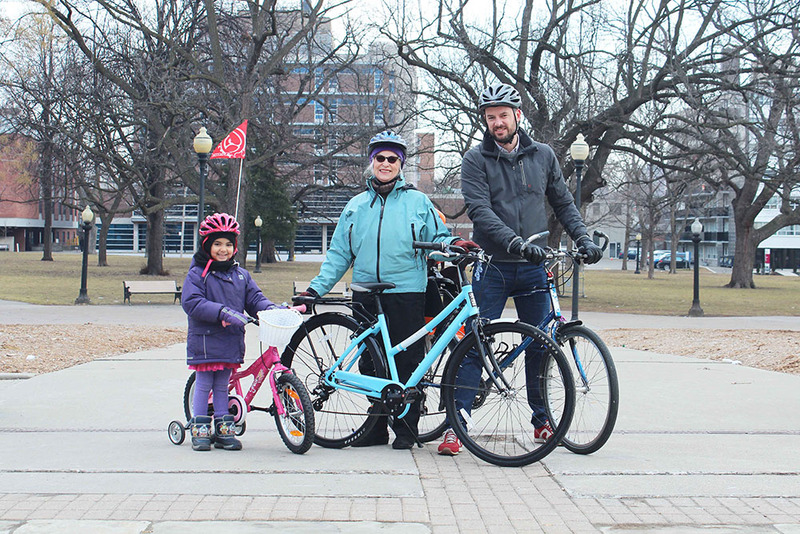 Three generations of cyclists in the family. Arel Agnew (the new Opus owner, right), Olive, and Brendan. 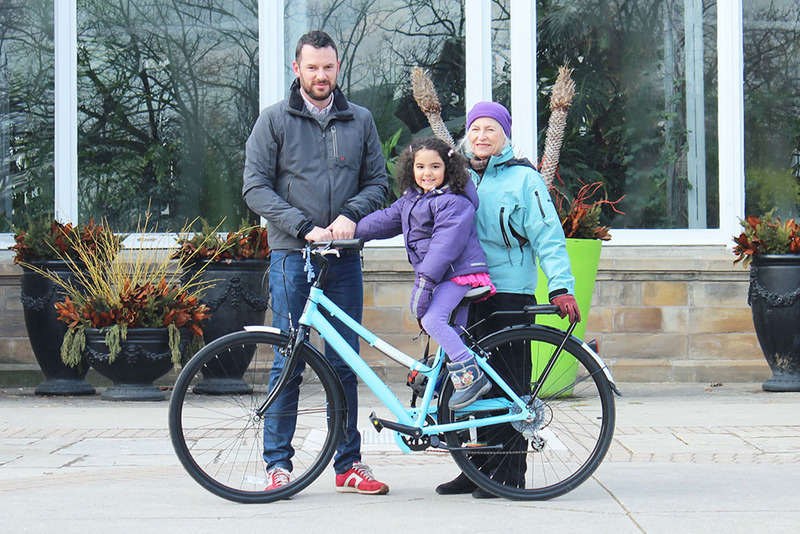 Brendan was the winner of our Opus raffle bike this holiday season, he was also responsible for transit and transportation for former mayor David Miller and currently works as a public affairs communications consultant at Argyle Public Relationships.